Submitted by lmcshane on Fri, 11/12/2010 - 12:16. Submitted by lmcshane on Fri, 11/12/2010 - 12:19. 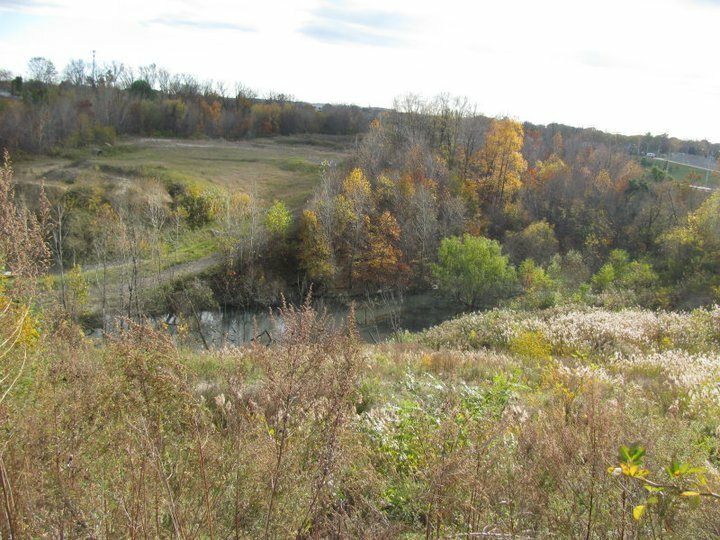 View from Gino Lane (off Jennings Road) of one of the creeks and wildlife habitat that could be destroyed by strip mining--Next Zoning Hearing Dec. 20 Room 514 City Hall 10:30 AM --Send your e-mail letters to Jhuber [at] city [dot] cleveland [dot] oh [dot] us in care of the Zoning Board Thank you --Help save our land and animals. Submitted by lmcshane on Fri, 11/12/2010 - 12:30. Baumann landfill would like to "strip mine" clay to lower the profile of their landfill--which has reached capacity--to reopen the landfill--Baumann needs to remove the clay...which actually serves to prevent groundwater contamination...see Notice of Intent. Old Brooklyn Development Corporation is participating in citizen involvement--call Tom Collins at 216-459-1000 for details. Disclose the membership of all west side CDC's....QUOTAS????? Submitted by ANGELnWard14 on Fri, 11/12/2010 - 15:13. More of the same debates... what is our purpose when no matter how much light we shed on the corruption-it continues at large on our public????? WHERE DID OUR HUD MONEY GO THAT WAS INTENDED TO HELP REBUILD OUR COMMUNITY????? WHY DID CDC's GET MILLIONS and the COMMUNITIES LOOK WORSE NOW THAN EVER????? (at least where the demographic data supported usage). Who can defend a community development/landbank that supports big government while destroying the economic development that comes with an OPEN MARKET of REAL ESTATE INVESTORS in our community? Is this not government control, dictation, and exclusion of the public of that community? How many citizens have signed up to be "MEMBERS OF THE NEW CDC for the Clark Metro Area" which is being led by the Detroit Shoreway organization in 2010?????? Please disclose the public list of members for both organizations separately.... We deserve to know how many folks actually support this regime that actually live within the perimeters of the area?????????? Yes, I am sure we will get that info in about 10 years when it's too late????? hahahah WHAT A JOKE ON THE PEOPLE WHO ACTUALLY LIVE HERE! Submitted by ANGELnWard14 on Fri, 11/12/2010 - 15:27. Send in your objections to the LANDFILL BOZA HEARING NOW! Submitted by ANGELnWard14 on Fri, 11/12/2010 - 15:29. Owners, Bill and Mary Ellen Bauman, owners of the Bradley Road Land Fill have requested a zoning variance for their property owned at 4300 Bradley Road. If you attend the meeting and want to speak you must sign in and say you speak in favor of or object to the variance. Google Baumann & Rokakis.... enumerable articles are CACHED! Submitted by ANGELnWard14 on Fri, 11/12/2010 - 15:32. Submitted by ANGELnWard14 on Fri, 11/12/2010 - 15:36. Submitted by ANGELnWard14 on Fri, 11/12/2010 - 16:14. Alex Rokakis Ohio Northern District by Rear Admiral Penington U.S Coast Guard Cleveland for his legal skill and professionalism in negotiating the settlement of longstanding dispute between the Coast Guard and shipping companies over the interpretation of the Great Lakes pilotage laws. Make some contributions like the rest! blah, blah, blah...the leadership and philanthropic folks don't give a damn how they have actually HURT the people and DESTROYED the communities around them by supporting our local government that denies economic development without pay to play politics being engaged. Submitted by ANGELnWard14 on Fri, 11/12/2010 - 20:11. Submitted by lmcshane on Sun, 01/30/2011 - 20:24.